I don’t know how long Costco has been carrying them, but I just stumbled across Aussie Bites at Costco yesterday. 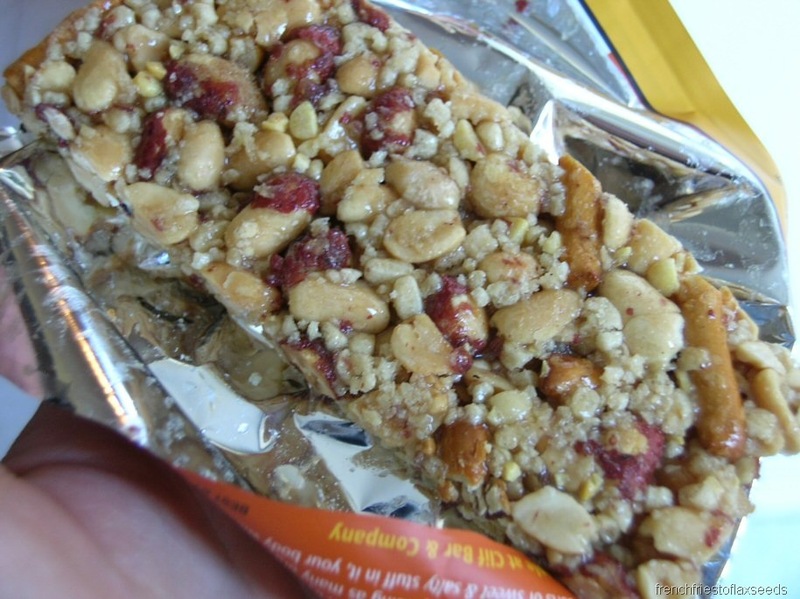 These seem to be a variation on the theme of Sunrise Energy Bars which I posted about here in November of 2012. They look like a smaller version of the Sunrise bars, they are packaged in a transparent plastic tub and sealed similarly (see pics). And that isn’t where the similarity ends. After I wrote about the Sunrise bars, Costco stopped carrying them for awhile. You can check the comments on that post for details. One of the items readers noticed were the Aussie Bites which seemed to be a substitute. I am a satisfied Costco customer, but don’t have a clue about their marketing practices. Items are on the shelves then they disappear. Sometimes they reappear, sometimes they reappear with new packaging. Not a clue. So, what about these Aussie Bites? 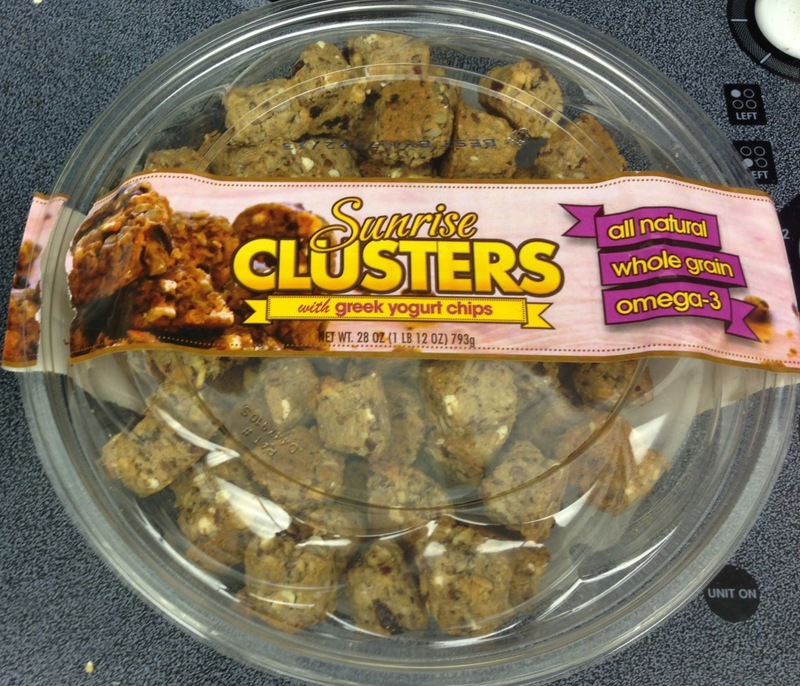 They are granola-like with a consistency closer to a muffin. I thought they tasted similar to the Sunrise bars although somewhat sweeter. 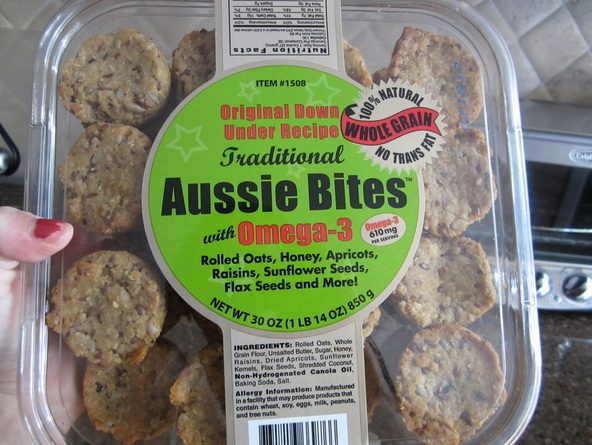 The Aussie Bites ingredients include: Whole grain rolled oats, Whole grain oat flour, Unsalted butter, Expeller pressed canola oil, Sugar, Honey, Dried apricots, Raisins, Sunflower kernels, Flax seeds, Shredded coconut, Baking soda and Salt. For nutritional comparison here is the breakdown for a single one ounce bar: 130 calories, total fat 6 grams, saturated fat 3 grams, cholesterol 10 mg, Sodium 75 grams, carbohydrates 17 grams, fiber 3 grams and 2 grams of protein. Although they have the same serving size, the Aussie Bites are smaller in size than the Sunrise bars, so you need to pay attention to how much you are eating. 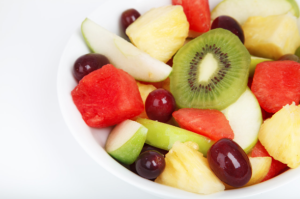 The 130 calories is not bad for a snack, but if you eat two or three that is another story. On the positive side, I think these are pretty dense nutritionally compared with junk food like Hostess Ho Ho’s which I wrote about two Novembers ago. 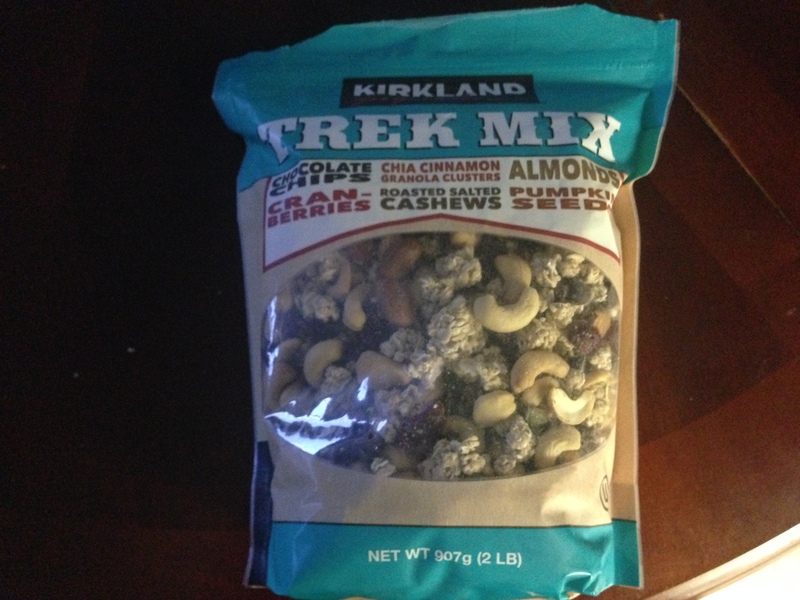 Personally, these work very well for what I consider to be energy snacks. I bring them along on a bike ride and eat about 50 calories worth when I take a break. So, I get energy without tying up my digestive system with a lot of work. 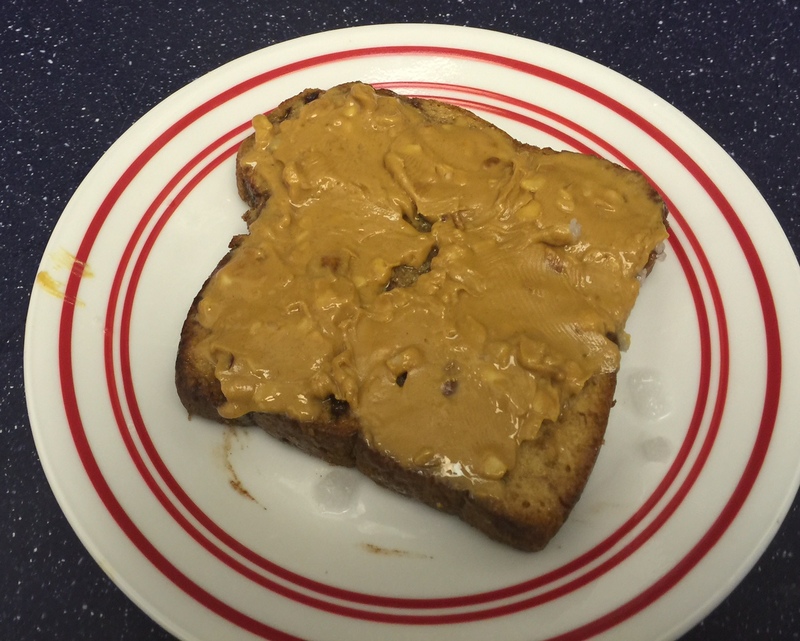 If you are a snacker, you might want to check out my Page – Snacking – The Good, The Bad and The Ugly. 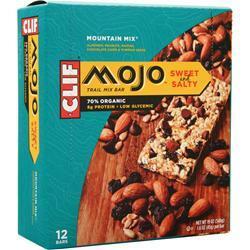 What About the Clif Mojo Sweet and Salty Bars from Costco? On the one hand, I have been eating ‘energy’ or ‘protein’ snack bars for over 40 years. I used to buy the old Balance Bars back when I was working as a reporter and couldn’t get away for lunch. So, I have a lot of experience with them. Likewise, today after retirement, while riding my bike daily and logging lots of miles, I rely on bars for my energy breaks and for fuel to keep me going. All this is a prelude to my having just discovered the Clif Mojo Sweet and Salty Bars on my last visit to, you guessed it – Costco. I’m sure regular readers are experiencing some deja vu here, as I have time and again written about my latest discovery from Costco. I must confess that while the Mojo bars are new to me, I may be like the husband, the last to know. I’m not sure how long they have actually been around. These new bars hit me right in the taste buds – sweet and salty. Everything I love. Before I got control of my weight, my appetite for both the sweet and salty treats contributed to my undoing. 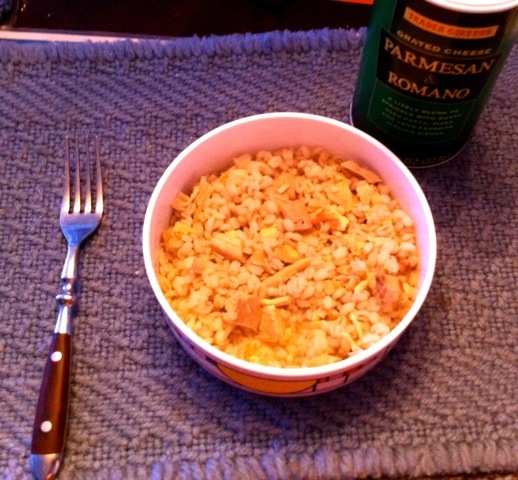 In the evenings, I used to snack on salty potato chips and pretzels and then finish off with ice cream or chocolate. That’s how I got up to plus 220 pounds and a plus 4o inch waist. You can read about how I lost 50 pounds in 52 weeks. Now comes a healthy treat that is both sweet and salty from the noted Clif kitchens. I love the taste as well as the texture of these bars. Serving size: one bar, 45 grams, about 1.5 ounces. How About Sardines and Crackers from Costco? I average going to Costco about once every seven to 10 days. For that reason when I saw sardines for sale there, I naturally took them as a new product. Now, I may have missed them previously, or the store may have moved them to a new position in the warehouse that became more obvious to me, but I don’t remember ever seeing them before. I like sardines and have been eating the Chicken of the Sea Brisling ones I got from a local supermarket. Naturally, I had to try the Costco ones. First of all, why eat sardines? 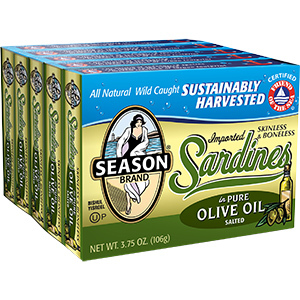 The World’s Healthiest Foods site says, “Sardines are named after Sardinia, the Italian island where large schools of these fish were once found. 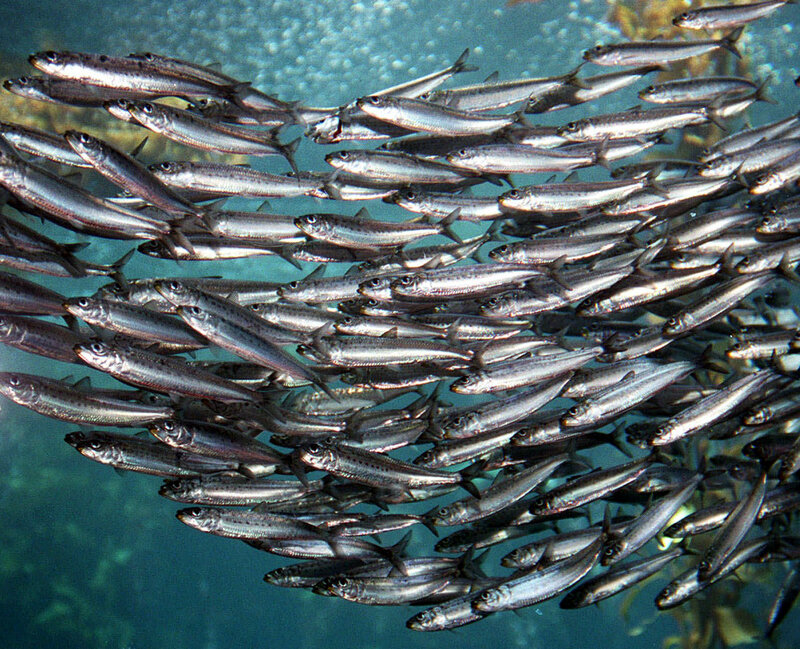 While sardines are delightful enjoyed fresh, they are most commonly found canned, since they are so perishable. With growing concern over the health of the seas, people are turning to sardines since they are at the bottom of the aquatic food chain, feeding solely on plankton, and therefore do not concentrate heavy metals, such as mercury, and contaminants as do some other fish. “While there are six different types of species of sardines belong to the Clupeidae family, more than 20 varieties of fish are sold as sardines throughout the world. What these fish share in common is that they are small, saltwater, oily-rich, silvery fish that are soft-boned. In the United States, sardines actually refers to a small herring, and adult sardines are known as pilchards, a name that is commonly used in other parts of the world. It is just less than a year ago since I wrote Why Should I Try Coconut Oil? 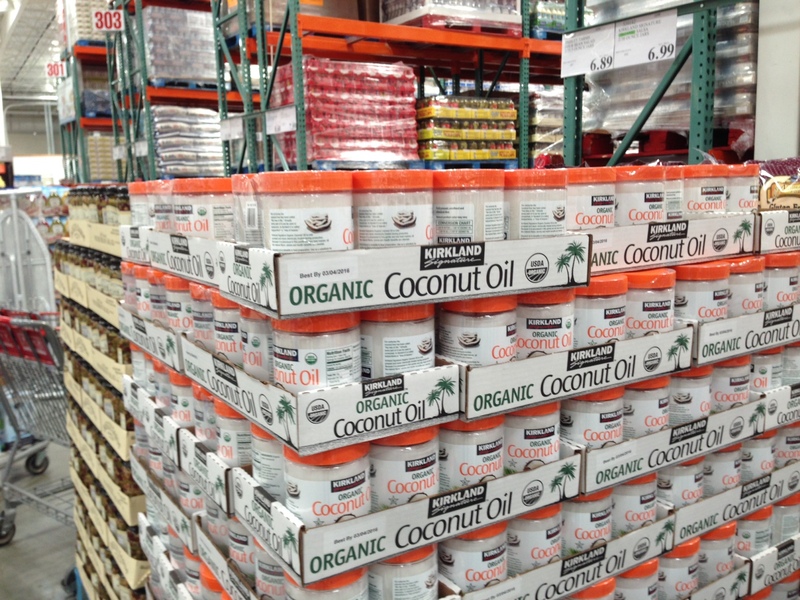 Today I was shopping in Costco and came upon this huge display of their own Kirkland Brand coconut oil. I guess that means that the product sold well enough for Costco to find a company to produce it under for the Kirkland brand. That is very good news to me. If you have been on the fence about trying coconut oil, please check out my Page – Why You Should Include Coconut Oil in Your Diet. There are at least a dozen good reasons including that coconut oil is one of the most nutritious foods on the planet. It is second only to mother’s milk in its amount of lauric acid. What could be more nutritious than that? Its medium chain fatty acids are easy on the digestive system. “It travels immediately to the liver to be converted into energy. It doesn’t circulate in the body and end up being stored as fat. So for a quick energy boost, eat a spoonful of coconut oil or add it to your food,” I wrote in that post. One difference between the new Kirkland brand and the previous brand at Costco was that the previous brand said “Extra Virgin” coconut oil whereas the new Kirkland brand simply has “Virgin” coconut oil. What is the difference? Good question. The best answer I could find was ‘marketing.’ While there is a major difference between virgin and extra virgin olive oil, no such distinction exists in the coconut oil world. 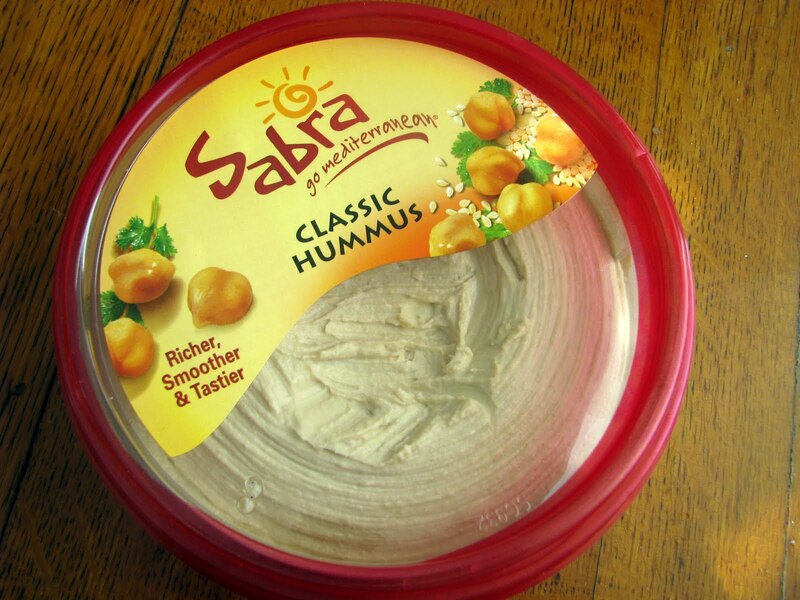 Regarding product size: the old brand was a big fat 54 ounce jar. The new one is 42.3 ounces, but you have to buy two jars. So, you end up with more coconut oil in the slightly more manageable form of two containers. Check it out for yourself. Costco knows a valuable product when they sell one. You should, too. 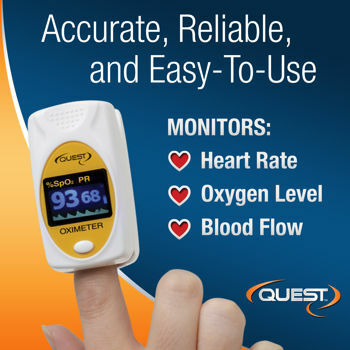 What is a Pulse Oximeter from Costco? The pulse oximeter pictured here is a neat little gadget that Costco is selling. As you can see from the picture, it monitors your Heart Rate (pulse), Oxygen Level and your Blood Flow. In sum, very useful information provided in a matter of seconds with no penetration of your flesh. There is even a cool graph of your heart beat on the screen. In this period of wearables, the Pulse Oximeter is reminiscent of the first cell phones. But, you can feel like a camp counselor and wear it around your neck using the attached lanyard. Before I go into explanations and specifications, I want to disclose that I bought one of these and have been using it for a week now. Love it! It is particularly useful when I am stair climbing. I like to get a handle on how my heart rate accelerates on the climb and then nosedives when I walk around to bring it down. Okay, what does it measure? Pulse Rate Measurement (BPM) – Measures the number of heart beats per minute. A normal adult pulse rate while resting is between 60 and 100 beats per minute. Oxygen Saturation (SpO2) – Oxygen saturation is a measure of how much oxygen the blood is carrying as a percentage of the maximum it could carry. Measuring saturated hemoglobin is a useful screening tool for determining basic respiratory function. Perfusion Index (PI%) – Perfusion index is an indication of the pulse strength at the sensor site. The PI’s values range from 0.2% for very weak pulse to 20% for extremely strong pulse. I have been a James Cameron fan ever since his epic creation The Terminator appeared in 1984. Cameron directed as well as co-wrote it. I enjoyed the subsequent offerings in the franchise and when Cameron co-created the Dark Angel TV series in 2000 I was there from the beginning. It broke my heart when they didn’t renew after only two years. Gorgeous 19 year old Jessica Alba played the title role of Max who was a bike messenger. As a daily bike rider, this hit me where I live. Cut to the present. I read in the Costco magazine recently that foxy Jessica Alba, now a 31-year old mom, has started The Honest Company that makes healthy household products. Max has managed to move the bar code from the back of her neck to the back of her shampoo bottle. Lo and behold, going through Costco this morning, I ran across a combination shampoo and body wash from … The Honest Company. Clearly using quinoa and coconut oil makes it very attractive to a guy who has blogged about both. I had to buy it and try it. Having done so, I can attest to its very clean ‘sweet orange vanilla’ scent. It produced only a fair lather which was disappointing, but I felt clean after using it. I will take their word that none of my natural oils were stripped away in the shower. Personally, as a fan of the benefits of a market economy, I don’t appreciate her calling her firm The Honest Company as if all her competition is not honest. I suppose that is typical Left Coast Hollywood thinking about big business. I believe that the firms that sell Old Spice and Irish Spring, and have been around significantly longer than Jessica’s company, are equally honest and produce worthwhile products. I know, I use them, too. So, even if you weren’t a Dark Angel fan, you might like to try her shampoo-body wash or other products. 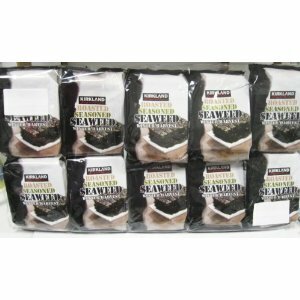 Back in September I wrote Snacking on Seaweed after buying a box of Roasted and Salted Seaweed from Costco. I tacked on an addendum to that post about a month later when I bought a second box of 24 packages. Clearly, I really enjoyed the seaweed snack. The last time I was at Costco there was a new Kirkland Brand of Roasted Seasoned Seaweed for sale. It came in a very large bag which contained 10 smaller packages of the product. 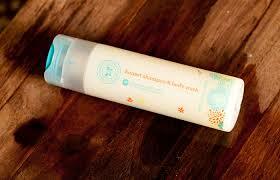 The seaweed I am talking about comes in a small sheet about 2-1/2 X 3-12 inches. So, what does this all mean to the potential seaweed snacker? A number of things. I have written time and again about reading ingredients labels and paying attention to serving size. This seaweed snack is a perfect example of that. 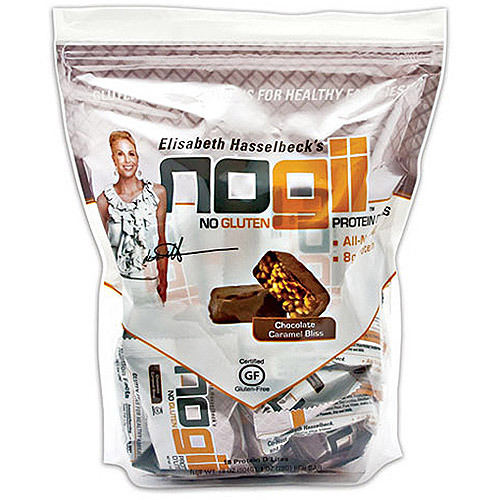 The first packages I bought contained around 10 of the sheets (5 grams) with the following nutritional breakdown: Only 30 calories, fat 2 grams, no cholesterol, Sodium 50 mg, carbohydrates 1 gram, fiber 1 gram and protein 1 gram. Once again, I got a great deal on a cool product from Costco. This time it was via email. Costco is sending out a flyer every day with Christmas deals on it. This was on one of them last week. Actually, one of the folks in my aerobics class inspired it. He has a heart rate monitor and I thought it was a nice idea to see how much of a load any workout put on my heart. Then the offer from Costco came, and I bit. Although I am somewhat computer savvy, I don’t love messing with them. So, I had misgivings about buying a little watch. It advertises that besides telling time there is a step count, calorie burn, distance and, of course, the heart rate monitor. I did not look forward to punching in a lot of this button and that button the feed it my vital statistics. But, the listing said ‘NO SET-UP.’ Costco advertised it as $39.95, on special for $25. So I ordered it. I have now owned it for two days and I like it a lot. The heart rate works very well. The watch has two contacts, the back of your wrist and a finger pad on the watch face. It takes only seconds to get a reading and so far they have been excellent. I had been using the iPhone monitor which requires taking your pulse for 15 seconds and multiplying by four. Slow and cumbersome, but no problem for biking. I couldn’t use it in an aerobics class. The step count works well, too. Because it is in your watch it is based on arm swings. I like this because when I ride my bike, I can’t have a pedometer on me that measures steps because my legs are pedaling away. My arms aren’t swinging at all. It says all day calorie burn, but since I use Lose It! I don’t need that nor use it, so I can’t comment on how it works. I know that the User Manual offers what they call ‘Advanced Set-Up’ which inputs your height, weight, age, etc. It was a little complicated, but not too bad. I don’t need to paint with that fine a brush. I like that it gives me an estimate of how many steps I took during the day, keeps accurate time and allows me to monitor my heart rate at a moment’s notice. For 25 bucks that’s a win. If you are considering starting a walking program, or would just like to get a reading on how far you walk on a given day, you might be able to use this. I feel strongly about the benefits of walking. Check out the walking tags at right for more details. As an old fogie, I like analog watch faces, so I am not thrilled that this gives a digital readout of the time. But, that’s personal and may have no relevance to you. As always your comments are invited. Addendum:Posted December fifth. I have just come back from my aerobics class and used the heart rate monitor successfully several times. Fascinating to see how my heart rate varied through the class. 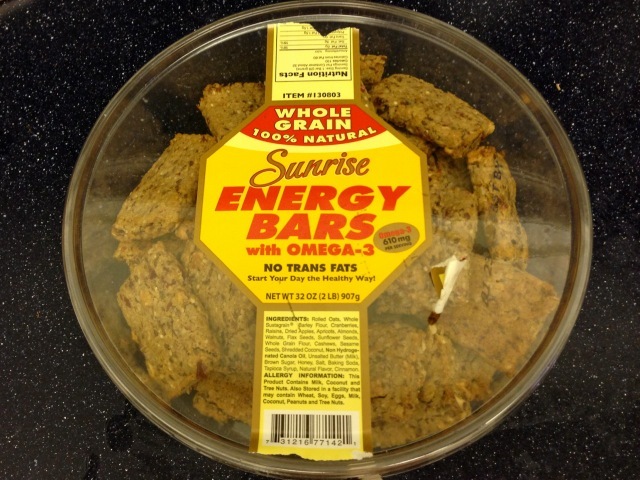 What Are Sunrise Energy Bars from Costco?